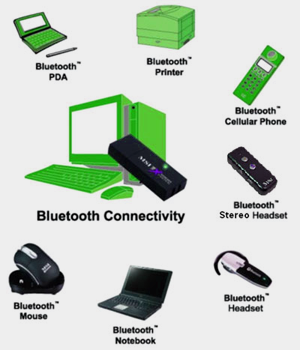 Bluetooth is the miniature wireless transmitter and receiver used as an interface to access LANs, PSTN, Mobile network and portable handheld devices. 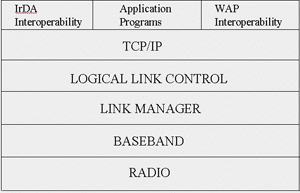 Bluetooth can communicate with the Bluetooth enabled devices through a short range network called ”Piconets”. When the Bluetooth enabled device enters the proximity of the piconet, it establishes connection with the Bluetooth.It is very useful for hands free communication in hand held devices. The technology of Bluetooth was named after Harald Blaatand Bluetooth II, the king of Denmark. 1. 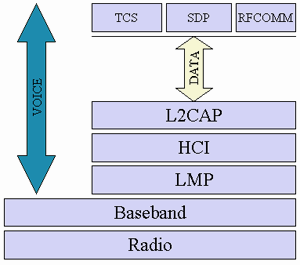 Radio layer – The bottom layer that forms the physical connection interface operating around 2.4GHz.